Portlander Stephen Green remembers the vibrant community of Black people in Oregon’s largest city. Growing up, he lived on Portland’s westside, but his Black–Puerto Rican family attended church in Northeast, and his family friends lived there, too. He remembers cookouts and barbecues, but he also remembers other things. Today, when there isn’t a Trail Blazers game or a concert in town, the Northeast Portland neighborhoods surrounding the Moda Center—commonly referred to as the Rose Quarter—are quiet. 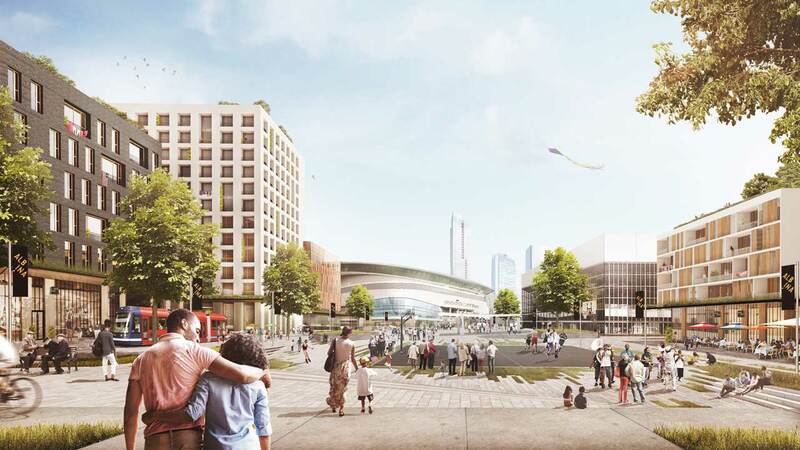 Currently, not many people live in the area, but a plan is moving through the hands of civic leaders, developers, and visionaries that estimates thousands more people could. This plan, called the Albina Vision, is a long-term project that addresses how to redevelop the Rose Quarter. It was first conceived in 2015, when a working group of artists, academics, community leaders, businesspeople, developers, and designers gathered to create a plan for the lower Albina area in Northeast Portland that was once a thriving working-class Black community but has changed over the decades because of gentrification, displacement, and the desire of residents to move to a more affordable part of town. Then-mayor Charlie Hales and executives from some of the city’s largest companies, including Moda Health executive vice president Steve Wynne, brought the group together. A 2017 document created by the group says “the Albina Vision is not prescriptive, but rather is a framework to foster the growth of a diverse, sustainable, urban district—on par with great neighborhoods of the world.” For inspiration, they looked toward Elbe Philharmonic Hall in Hamburg, Germany; Millennium Park in Chicago; and the Edge Park in New York City, as well as other sites throughout the world that connect people to each other and often incorporate bodies of water and cultural institutions. After the project’s initial year, several team members continued to move forward with the vision. Their goal was to refine it from a broad idea to something more specific. They also formed a nonprofit, the Albina Vision Trust, to help carry the vision through to reality. “The vision is for putting our values first and having more equitable, community-centric development happening in Portland,” says Adams, whose day job is as chief investment officer at the Meyer Memorial Trust, one of Portland’s largest charitable foundations. Zari Santner, a member of the Albina Vision Trust and a former director of the City of Portland Bureau of Parks and Recreation, says, “It’s about being intentional about developing a large area of [the] central city with a very interesting and thought-provoking history.” According to Santner, the Albina area includes some of the last significant land in the central city that’s available for mixed-use development. 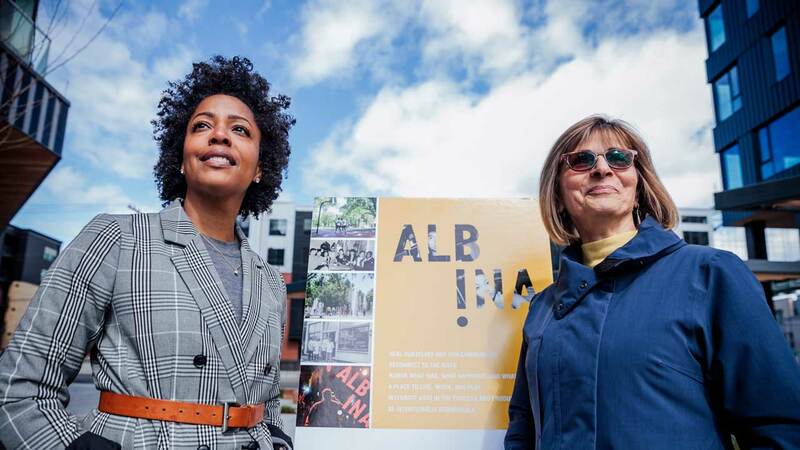 The group behind the Albina Vision says it wants Albina to be representative of the people who lived there in the past and to be affordable, inclusive, and multicultural. “We could create a community that has all the vibrancy of the Pearl [District] but with different occupants,” Santner says. Census data show that 84 percent of the Pearl District’s residents are white, and, according to a real estate analysis by Portland Monthly magazine in 2017, the median gross rent in the westside neighborhood near downtown was $1,164 a month, and the median annual household income was $62,344. Santner, the former parks director, knows that government won’t be able to raise enough money to fund the level of affordability that the team envisions: buildings in which 50 to 60 percent of residential and business space is affordable—a much higher percentage than that of most buildings across the city. “If you leave it to the market, you have the Pearl District,” Santner says. 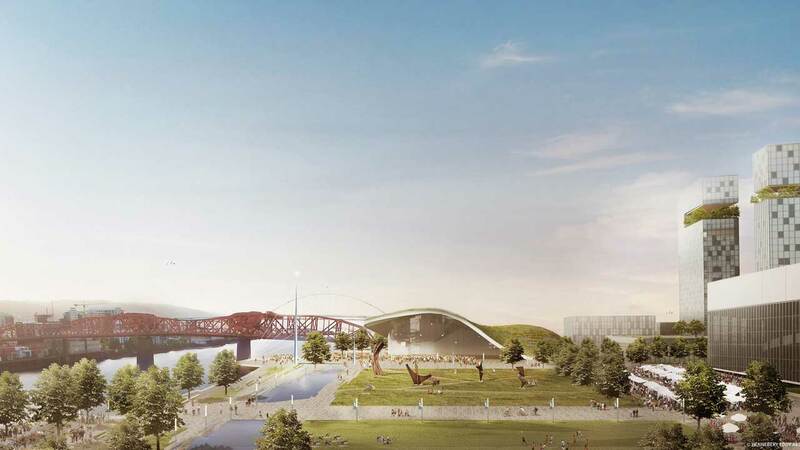 “It’s time that we coexist,” Santner says, adding that the process mirrors the team’s values of honoring the area’s history, beginning to heal those affected, and reconnecting the community to the Willamette River. The City of Portland, Portland Public Schools, and the Portland Trail Blazers own most of the land in Albina. The Albina Vision Trust hopes to use its influence as development progresses in the area, encouraging land and building owners to adopt the plan’s values when green-lighting projects. Portland is viewed as a progressive city that has developed a few sectors well. There’s the transit system that spans most of the city by bus or rail. There’s the embrace of nature within the city, and the streets are designed in a way that is reminiscent of vital old downtowns that encourage people to interact with one another. But when it comes to equity, there is room for improvement. Other organizations across the country are exploring what equity in city planning and development could look like through community land trusts and by supporting businesses owned by people of color through start-up capital and new models for local economies. Based in another quickly gentrifying city, the Boston Ujima Project aims to address problems that have gone unresolved by elected officials, such as poverty, unemployment, and rising property prices. The project brings together businesses and developers, investors, grassroots organizations, unions, and civic organizations. Ujima Project members make up the organization’s governing body, which makes decisions democratically about investments in the greater Boston area and within the smaller, historically Black communities of Roxbury, Dorchester, and Mattapan. Nia Evans, the project’s director, first learned of Ujima in 2015, when she was the executive director of the Boston branch of the NAACP. Evans says she listened to community members who were connected to the NAACP expressing frustration—they were tired of bad things happening to them and of not being a part of decision-making. At a recent workshop put on by Ujima, participants named real estate and infrastructure as top priorities for investment. “[The project is] important because it’s a mechanism by which community members can directly determine, directly plan, directly develop, directly implement our own agendas for our own communities,” she says. The project is focused on investing in small business in 2018 and is looking into making real estate investments as early as 2019. In Cincinnati, a nonprofit called Mortar is making an effort to ensure that people in the city benefit from the growth taking place there. Like Portland, Ohio’s third-largest city has changed dramatically over the last couple of decades. In particular, the neighborhood of Over-the-Rhine, where Mortar operates, has gentrified dramatically because of hundreds of millions of dollars in public-private investments that spurred a resurgence of new housing and business development. A 2011 report from McClatchy Newspapers showed that the neighborhood had one of the highest rates of income inequality in the nation. Mortar helps entrepreneurs in the area who might not have access to capital and mentorship by offering access to business support and brand development strategies, as well as networking opportunities. Portland was incorporated as a city in 1851, and in 1870, the City of East Portland was incorporated. What is now referred to as the Rose Quarter was long called the City of Albina, which was developed in 1874 and incorporated in 1887. 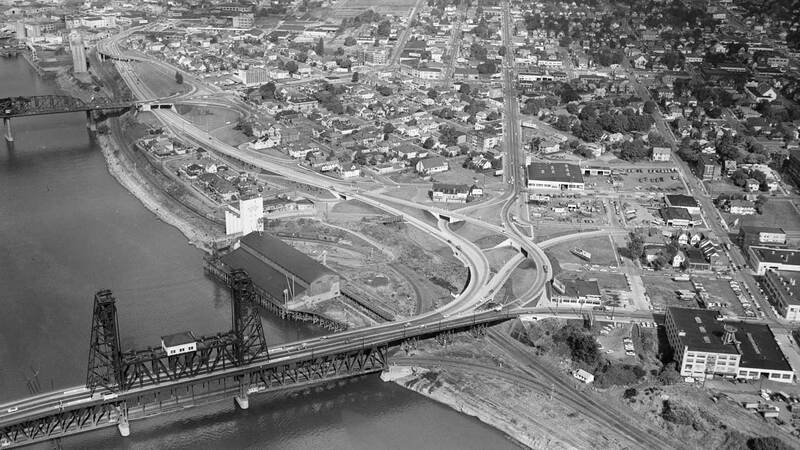 It ran from what is now called the Central Eastside Industrial District, hugged the east bank of the Willamette River, and extended north to the City of St. Johns. In 1891, voters approved of the consolidation of Albina, East Portland, and Portland into one city. In 1948, residents of Vanport City—some sources say as many as one-third were African American—were displaced by the Vanport flood and relocated to Portland. Displaced Black residents were primarily concentrated in the Albina area because of housing discrimination policies and practices such as redlining. In 1954, voters approved the building of Memorial Coliseum, the first of numerous urban renewal projects meant to clear blight, a term that urban reformers started to use in the first quarter of the twentieth century to describe the poor sanitation conditions they noticed in cities, but later came to refer to economic stagnation, as evidenced by low property values, unemployment, and disinvestment. In Albina between 1960 and 1970, plans to clear areas deemed blighted ultimately displaced more than three thousand residents—again, most of them African American. The people who were displaced moved to the far reaches of the city. Stephen Green says that the existence of the Black community in Portland “has been nomadic, and a lot of that has to do with racist real estate practices, outright and implicit bias, illegal lending practices. You name it, we’ve been subject to it.” He adds that many African Americans haven’t been able to own property in certain parts of the city until the ’90s, when outright illegal lending practices ended. In 1993, the City of Portland released a community plan for Albina. It included policy recommendations for land use, transportation, and employment. Its introduction reads, “The Albina Community Plan represents a major commitment from the City of Portland as well as from the citizens of Albina to improve the quality of life in the district.” According to Rukaiyah Adams, there have been several other attempts to revitalize the area, most of them driven by developer interest. For example, a campaign was launched in 2009 called “Imagine JumpTown.” It was a proposal by the Portland Trail Blazers to develop a mixed-use sports and entertainment district similar to Los Angeles’s LA Live, home to the Staples Center, the Grammy Museum, and dozens of eateries and fancy hotels. The name “JumpTown” was taken from the area’s once vibrant, predominantly African American jazz scene. The Albina Vision aims to reclaim the multicultural community of Portland from decades ago. While team members say feedback about the project has been mostly positive, Santner says that some people are skeptical because they have been promised change from the city before and those promises haven’t always been kept. She says trust begins to build when community members learn the Albina Vision plan isn’t affiliated with a government entity. Adams says the city’s development agency, Prosper Portland—formerly called the Portland Development Commission—has, for the past thirty or forty years, bulldozed communities and built new things, then pretended that they aren’t on the hook for gentrification, even as the Black population in Portland has been displaced because of some of these changes and policies. When these projects were in their infancy, they garnered support from the agency. With voters’ approval, the city built Memorial Coliseum in the 1950s. In the 1960s and ’70s, the PDC approved Legacy Emanuel Medical Center’s plans to expand with little community feedback. When Prosper Portland changed its name in May 2017, it noted that the change reflected “the agency’s shift toward more inclusive economic development,” pointing to agency programs aimed to address disparities in neighborhoods that for decades didn’t benefit from economic growth in Portland. “I am challenging them to do different and do better,” she says. Next steps for the Albina Vision plan include securing funding and pushing for change in a current city development plan. There are some projects that are more urgent than others. For instance, with the proposed expansion of I-5, the team is pushing for the freeway to be covered, adding open space for a park or promenade. Team members also plan to continue engaging with community members, bringing together people who they think might become a part of the Albina community to create a more detailed plan for the area. Adams says that through this process, she’s been forced to think about how we can change the political apparatus into one that hears ideas and takes them seriously. “We need to have more elected folks who can help drive it from the institutional side,” she says. Adams says she is learning that plans like the Albina Vision sound critical to some of the well-meaning city employees who work in the city’s development agencies. She also recognizes that the prospect of a bunch of citizens coming together and saying, “You know what, we actually think we can do this. Get out of the way,” could be threatening. Adams says the plan is a fifty-year vision, “so I’m not going to live to see it to fruition.” She notes that she and Michael Alexander, a former president and CEO of the Urban League of Portland who serves on the Albina Vision Trust board, have held a series of meetings with members of the African American community. “We’ve already started communicating with small groups of people to just validate whether people care, do they think this is a good idea,” Adams says. “This is what justice looks like,” she says. Native Los Angeleno Deonna Anderson is a freelance reporter who is currently based in Eugene, Oregon. She has experience covering city government, social issues, and equitable economic development. Anderson's work has been featured in Next City, The Marshall Project, and Vice's Motherboard. She is an alum of the University of California, Davis and the CUNY Graduate School of Journalism.